Franklin & Marshall football is off to a fantastic start, winning all of their first four games. While they routed their first two opponents, Lebanon Valley (44-21) and Juniata (40-17), the Diplomats had close victories against McDaniel (21-14) and Susquehanna (14-7). The Diplomats faced off against the Susquehanna River Hawks in a nail-biting thriller on Saturday, September 22. Franklin & Marshall won the coin toss and deferred; therefore, the River Hawks started with possession. Susquehanna got off to an explosive start as they marched down the field, unable to be stopped, all the way to the Franklin & Marshall’s 3-yard line. The River Hawks quarterback barreled into the end zone for a touchdown. After about 5 minutes into the game, the Diplomats trailed Susquehanna 0-7. Franklin & Marshall’s first drive down the field was unsuccessful. Susquehanna failed to score on their second drive due to F&M’s strong defense including a sack by Defensive Lineman Brendan Kilkenny. Franklin & Marshall had the ball at Susquehanna’s 45-yard line at the end of the first quarter. The Diplomats pieced together a strong offensive drive at the start of the second quarter. Following a nice 10-yard rush by Keshon Farmer, quarterback Tanner Erisman had a 20-yard completion to wide receiver K.J. Pretty, securing a Diplomat first down at Susquehanna’s 22-yard line. After some short gains, the Diplomats had a 3rd and Goal at the 7 yard-line. Erisman made a great throw to Pretty in the end zone for the Diplomat’s first touchdown of the game. After 7 minutes into the second quarter, the score was 7-7. The Diplomats forced Susquehanna to have a 3 and out in their first possession of the third quarter. F&M marched down the field in their second drive of the second quarter. Running back Joe Hartley-Vittoria’s short rushes and Erisman’s 22-yard completion to wide receiver Timothy Walter moved the F&M offense to Susquehanna’s 9-yard line. Unable to find the end zone, the Diplomats attempted to kick a field goal. However, it was blocked and recovered by Susquehanna. In their final drive of the half, Susquehanna reached Franklin & Marshall’s 1-yard line. However, linebacker Sebastian Silva-Muniz prevented a touchdown by forcing a River Hawks fumble recovered by F&M’s defensive back Nick Leone. Franklin & Marshall had possession of the ball for the last 13 seconds of the second half. Going into the second half, both teams were eager to break the 7-7 tie. However, both Franklin & Marshall and Susquehanna struggled to get any kind of offensive rhythm in the 3rd quarter. In the 4th quarter, possession went back and forth between the two teams. With about 2 minutes left in the game, the River Hawks fumbled the ball on a punt return which was recovered by Mack Focht on Susquehanna’s 41-yard line. On Franklin & Marshall’s first play after recovering the fumble, Erisman was sacked by the River Hawks who ultimately forced him to fumble. Susquehanna recovered the ball at their 45-yard line. With 1 minute and 16 seconds left in the game, the Susquehanna offense was halted by a strong F&M defense, forcing the River Hawks to go 3 and out. 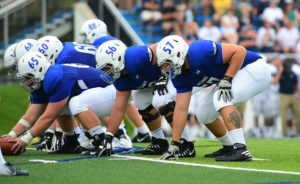 With 52 seconds left, F&M failed to score, making the game to go into overtime with a 7-7 score. In overtime, the Diplomats started on Susquehanna’s 25-yard line. In the first play, Hartley-Vittoria rushed for a 4-yard gain. On 2nd and 6 at the 21-yard line, Hartley-Vittoria juked past the defense and rushed for 21 yards into the end zone for a touchdown. Kicker Drew Tomlinson’s extra point was good. The Diplomats now led 14-7. With their last chance to score, the River Hawks started at Franklin & Marshall’s 25-yard line. After reaching the 5-yard line, defensive back Marlen Fenstermacher intercepted the pass from River Hawks quarterback to secure a victory for Franklin & Marshall, 14-7. The Diplomats play at Johns Hopkins next Saturday, October 6th in hopes of continuing their undefeated season. First-year Jamie Belfer is ta Contributing Writer. Her email is jbelfer@fandm.edu.